I turned Duffy out in the big arena this afternoon, and Bella out in the sick pen. Both of them seemed to enjoy themselves. Neither was very ambitious, considering it was a cool and breezy day. Bella just visited with Amber . . .
. . . and sauntered around looking for edibles. Later, we walked around the place together. 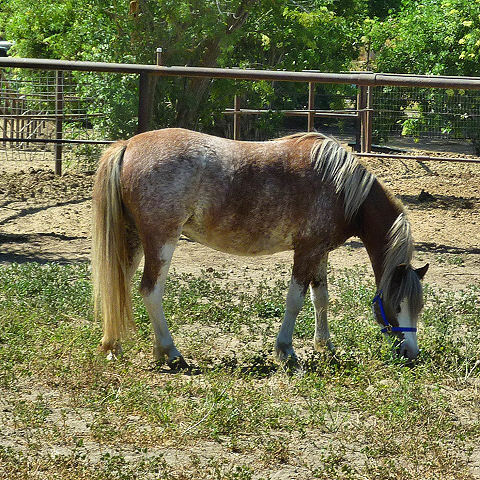 She will stop and stand without moving a hoof while I walk around behind her, scratch her tail for a while, walk back up her other side, flip the leadrope over her head, and go back to the leading position. Then I slip her a bit of carrot, walk a few steps, and do it in the other direction. I can hardly wait for her real training to begin. 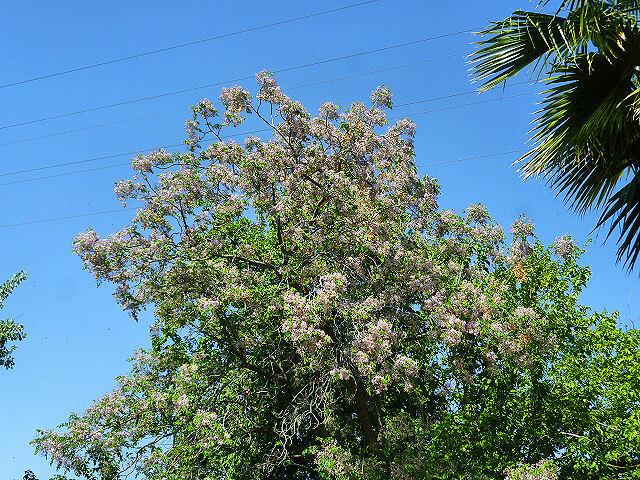 We passed the old chinaberry tree, which is in full bloom now. The individual flower’s aren’t very pretty, and from a distance they appear a grayish-lavender; but the scent is heavenly. I’ve got a bunch in the kitchen now, and they’re perfuming the whole house. Since the pups brought me a fairly large dead carp yesterday, it could probably use it! Well, I went for my checkup this morning. The waiting room was packed. I got there at 9:50, and got out at 11:50 — two solid hours, of which maybe 15 minutes was spent actually with the doctor. I’m not really complaining, though. I like my doctor — actually a P. A., Janice — very much indeed. And all of the news was good; all of the numbers that were supposed to be down were down, and the number (good cholesterol) that was supposed to be up was up. And I’ve officially lost 47 pounds in less than a year! No, I’m not complaining. I wonder how many women pushing seventy are still on no medications at all? I’m betting it’s less than fifty percent. But my day was pretty much used up, by the time I got home through the noon traffic. I’ve barely been outside. 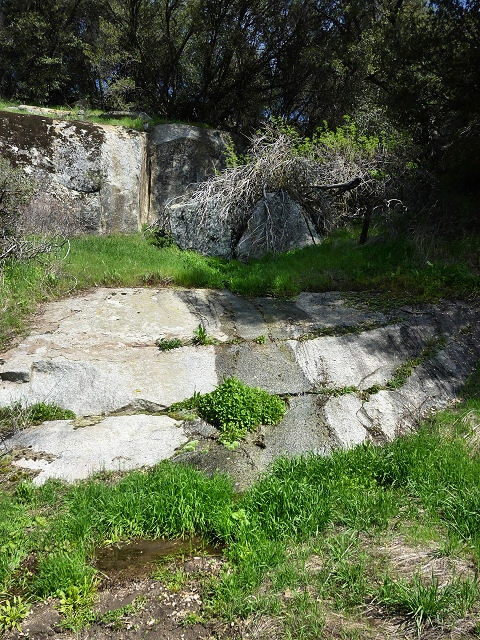 So here are a couple of pictures that didn’t get posted from the wildflower trip at the beginning of April. Here’s a little bitty waterfall. Might that make it a waterseep? 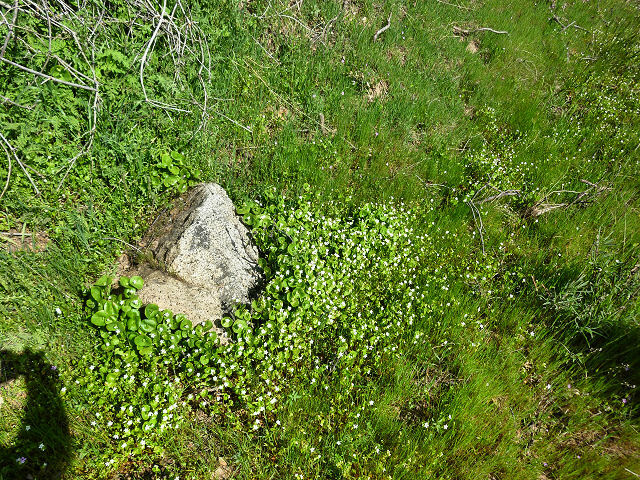 The lush greenery around this boulder is miner’s lettuce. It’s supposed to make a very good salad, but I’ve never worked up the nerve to try it on Billy. 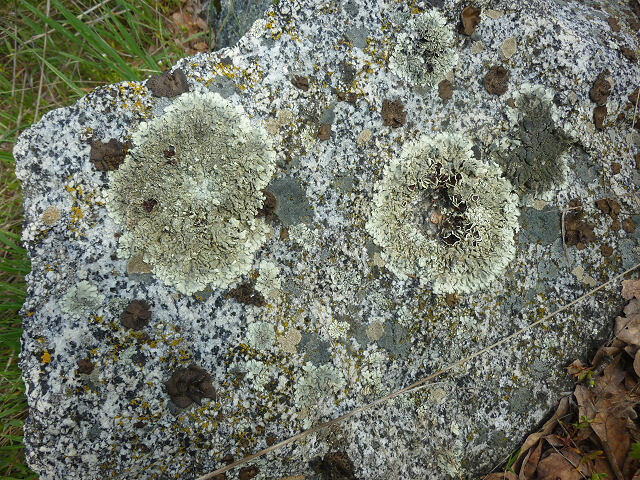 The lichen on this aged boulder makes it look as if it were looking at you. And that’s all until tomorrow . . . 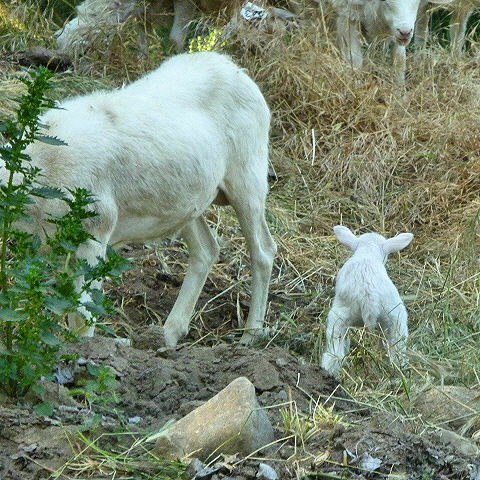 The new lamb is strong enough now to go out to the temporary pasture with the other sheep. He seems to be enjoying it immensely. Here he is, exploring. You can certainly tell which is his anxious mother. He’s beginning to leap around, more or less successfully. Here he’s just getting up after falling off of the dirt pile. I tried to catch him in mid-air, but haven’t managed it so far. He’s also figured out that reaching the ground is much easier if he bends his knees a little. What he hasn’t learned is what is edible. Last year’s dead leaves can’t be too tasty. 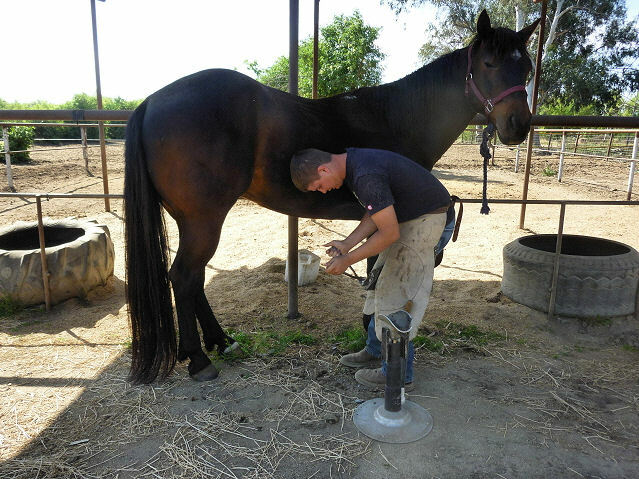 Andrew had a horse to trim this morning that is hard to catch, so I suggested that I try it first. 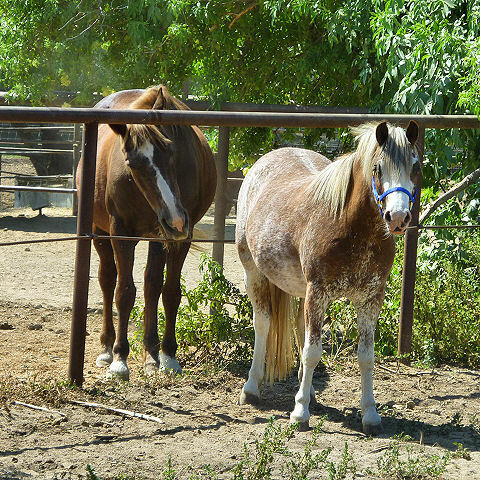 Many horses are easier for a woman to catch and handle. I wasn’t too sure it would work with this one, but sure enough, he let me walk up and put the halter on. Once he was caught, he was not trouble at all. At least Andrew’s face shows in this shot. Knitting and crochet season, that is. Soon I’l have to find another hobby until the weather cools again. 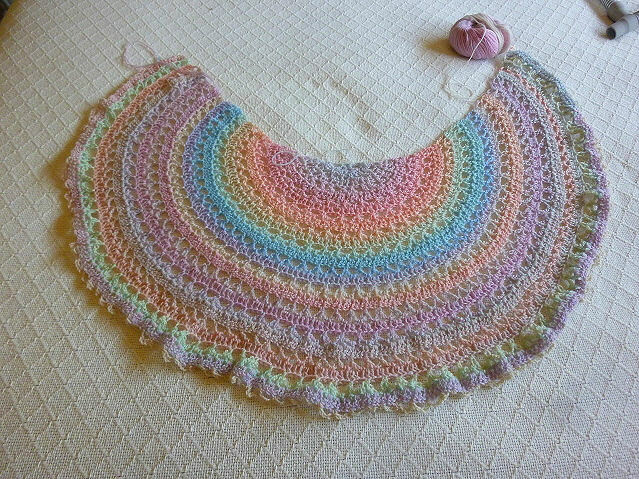 I did manage to finish one last thing, a little shawlette. It turned out rather pretty, and it’ll be prettier yet after it’s blocked. It’s from a vintage crochet pattern, though it’s a little difficult for me to think of 1972 as “vintage”. It doesn’t seem that long ago. Billy and I would have been married for only a year, then. I guess that means we have a vintage marriage! Does it get boring for me to write about my morning walks? It’s so beautiful out there now; it’s hard to resist sharing. 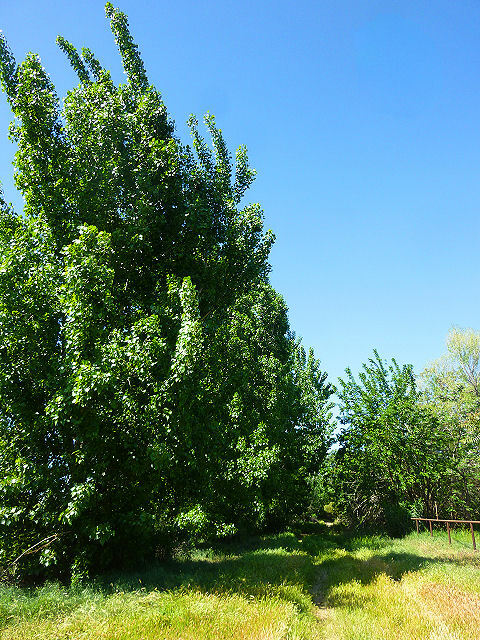 Look at these tall young cottonwoods; we planted them as spindly babies. And the view downriver has never been better. 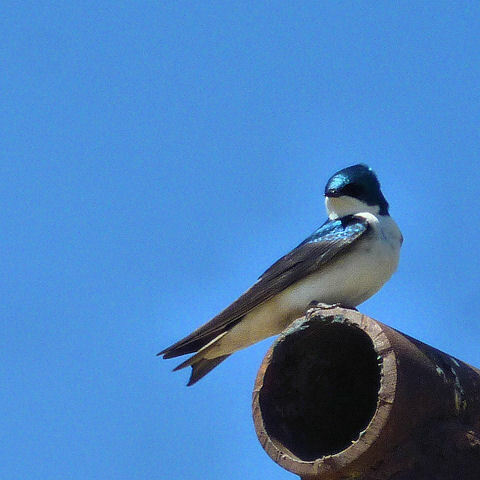 I’m still trying to get the best picture I can of a tree swallow. I’m not sure what jewel their color is most like. Sapphire is too blue, and turquoise is too dull. 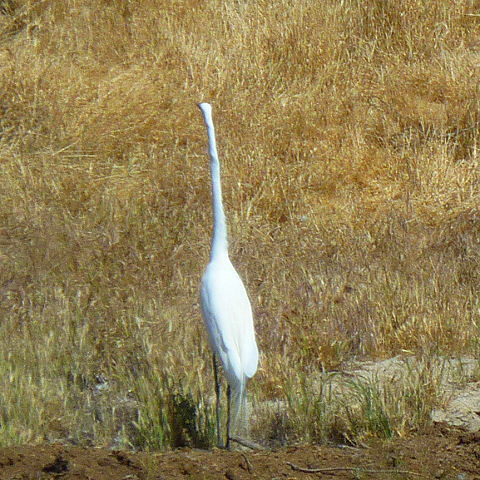 I came upon an egret this morning. He flapped away before I could get a bead on him, but I got this picture after he landed again. He was doing the long thin thing they do when alarmed. 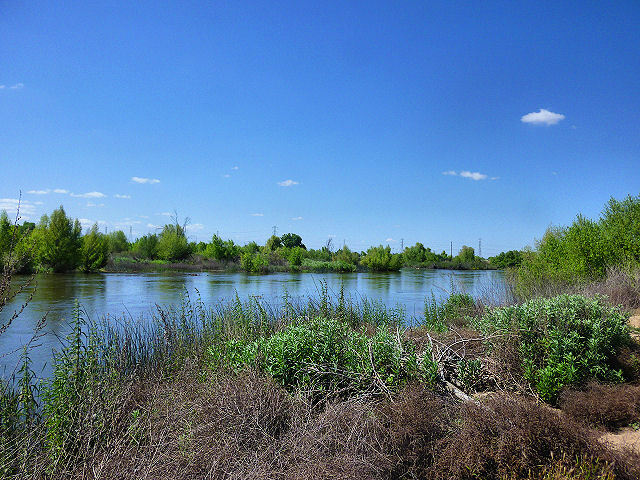 I can hear the quail going pit-pit-pit in the underbrush, and watch the cottontails hopping away, and be scolded by a squirrel. 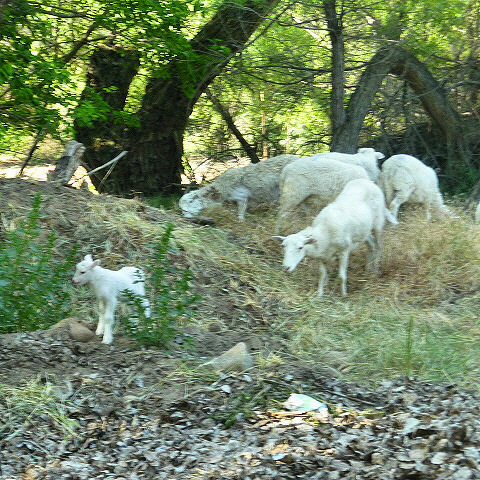 The new lamb is doing very well. 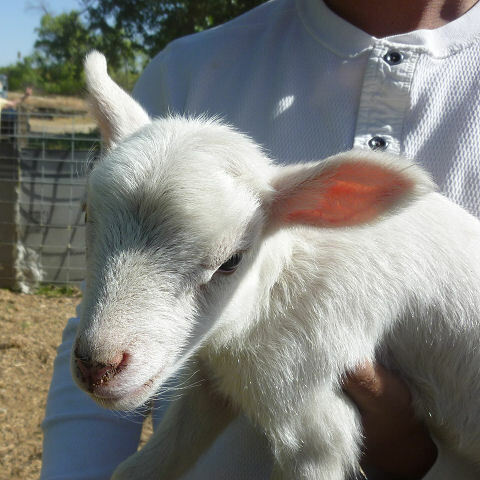 It’s a he, by the way, and he’s already put on weight and learned to use those wobbly legs much better. 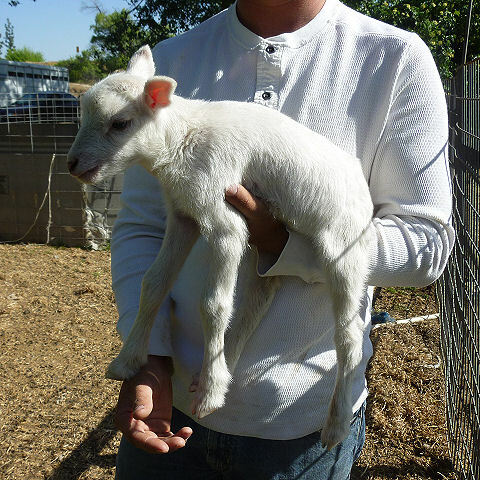 I have to say, the first lamb was cute but this one’s adorable. Those knobby knees . . . that snow-white coat . . . I suppose someday I ought to get Andrew’s face into one of these shots. 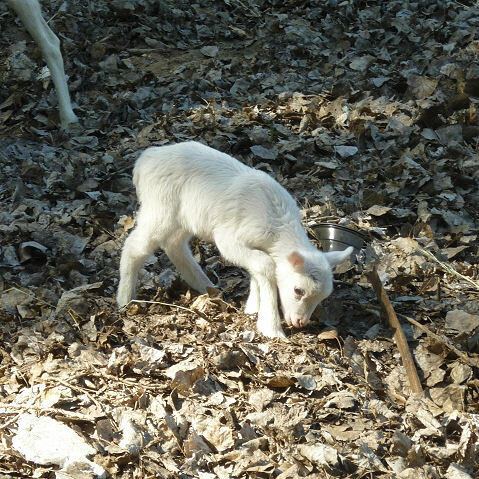 As a grandma I hate to say it — but the lamb’s a lot cuter.
. . . to everyone! Just a pretty picture today . 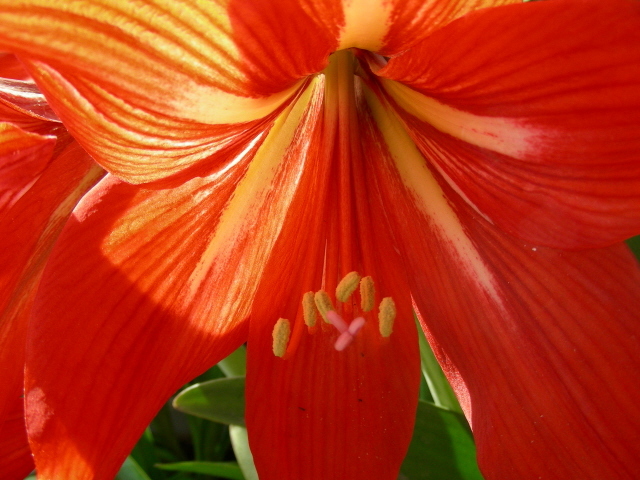 . .
One of my favorites; an amaryllis from ’07. And they’re about to bloom again!